Tewhakarewarewatangaoteopetauaawahiao, what a beautiful name for an unusual village. The meaning of the name is “the gathering place for the war parties of Wahiao”. Three hundred years ago a warrior chief named Wahiao gathered an army to avenge the killing of his father. 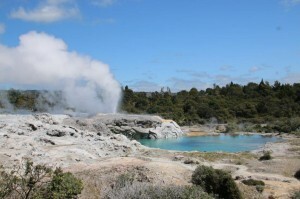 The Whakarewarewa Village, (the shortened version of its name) is a living thermal village in Rotorua, built upon active geysers, thermal hot springs and bubbling mud pools. 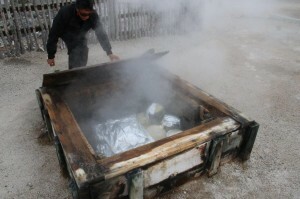 The 250 people who still live in the village use the thermal springs for cooking, bathing and heating. Only because I missed the road to go to the official state museum, did I see the village, steaming, which I first thought to be fog, in the early morning sky. I intended to walk over the bridge, when a friendly guide told me that I have to buy a ticket and that the guided tour will start in five minutes. “Kia ora” – again, another friendly woman greeted me as I was the only tourist so early in the morning. She talked me through a short history of the village, explained that the tribe is all one family, in which she is the daughter of the Chief, and inside the complex should be thought of as her home. So once I stepped through the gates, I became a guest in Waimaaria’s home, where she grew up and is still living. Her face lit up as she told me stories of a happy childhood playing amongst the hot water and mud pools, helping her mother and grandmother with the cooking and enjoying their family baths after five, when the tourists were gone and they had their privacy back. 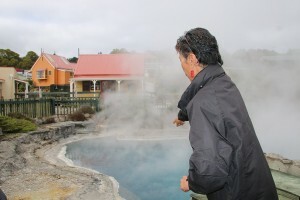 While walking through her village, I could feel the warmth emanating from beneath my feet and the healing vapour from the geothermal pools on my skin. Walking further on she explained me, although they are equipped now with modern kitchens and showers, they still cook their vegetables and meat in the “hangi”, which is a wooden box, built into the ground to trap the steam, or in the hot pools where only vegetable can be cooked, as the fat of the meat would react with the water with explosive consequences. When my guide Waimaaria opened the lid, the air became filled with the smell of meat, herbs and vegetables that made my mouth water and to keep going with the knowledge that there is a restaurant in the village where you can try this delicious food, and I can tell you – it was exquisite. 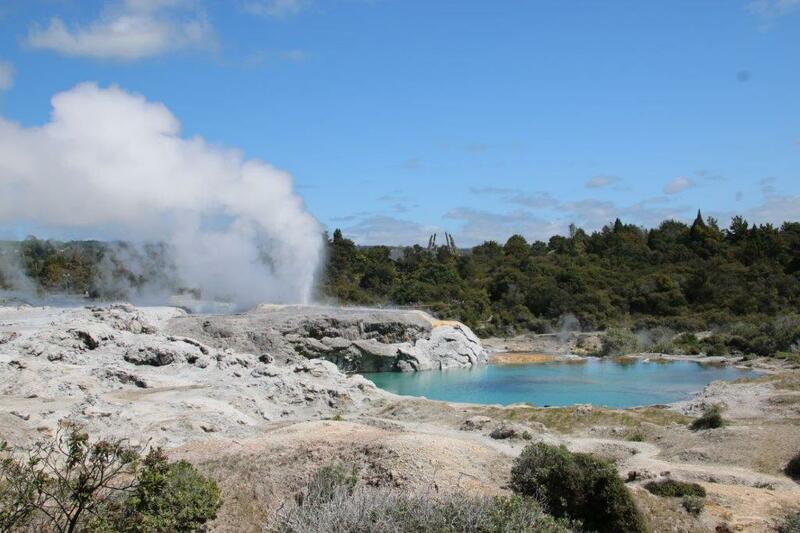 One of the highlights of the tour is the view of the “Prince of Wales” and the “Pohutu” (big splash) which is the largest geyser in New Zealand, rising at times up to 40 metres. The other one is the 30-minute traditional dancing show, which I must say, if you have seen it once, you needn’t be surprised that it is the same that you have already seen somewhere else. This lovely place where you can feel that traditions play a high role, doesn’t let you feel like a tourist, instead I felt kindness, and I felt them being proud to be an ancestor of Chief Wahiao. Doris is an Advanced student at Languages International. She is a teacher in Switzerland and will soon be taking the Cambridge CELTA at Languages International.